As a consumer, you have virtually endless options for credit cards. Just as everyone's needs for credit vary, each credit card has its advantages and disadvantages. At Kard, you can optimize your credit card use so that you'll get maximum rewards on every purchase you make. The basic advantage of using a credit card is that you can make purchases at any time without carrying cash. Providing a credit card imprint or number also acts as a deposit on hotel rooms and car rentals, or lets the cardholder make secure online purchases. Most companies offer protection and monitoring in case of fraudulent use by a third party. Some cards offer additional value including cash back, rewards points, special deals on certain brands, and preferential treatment on flights or at hotels. Others recruit customers by offering an incentive to sign up, such as bonus points or a free gift. There are also varied costs to the user such as an activation fee, annual fees, or high interest rates. Kard lets you take advantage of the direct relationships that credit card companies make with top brands as well as their own promotions. For example, they may be offering extra cash back on purchases from Sephora, Macy's, or JCPenney for a few days or simply have a month of extra cash back on all electronics purchases. 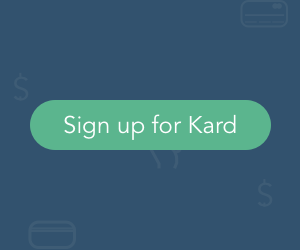 When you create your Kard account, you'll be invited to install an extension on your browser that notifies you in real time of extra point values, cash back, and rewards attached to the credit cards you already use. Create your profile today to maximize your rewards as you shop online. No personal information is required.